Could the Louvre’s “Virgin and St. Anne” provide the proof that the (London) National Gallery’s “Virgin of the Rocks” is not by Leonardo da Vinci? When the National Gallery’s restored “Virgin of the Rocks” was pronounced an entirely autograph Leonardo we were left reeling with incredulity. Picture restorers rarely decline opportunities to claim “discoveries” but could they really be claiming an ability to make a picture an autograph Leonardo simply by thinning its varnish? During the media frenzy of the National Gallery’s £1.5bn Leonardo blockbuster, its chief restorer, Larry Keith, was asked if a distinctive Leonardo brushstroke had emerged. “No”, he said, proof of authenticity lay in the picture’s internal relationships. Given that those relationships differ markedly from the ones present in the Louvre’s unquestionably autograph “Virgin of the Rocks”, what accounted for the discrepancies? The then curator, Luke Syson, replied that Leonardo’s style had, in the London copy, become abstracted, less naturalistic and more “metaphysical”. This seemed fanciful: had not all of Leonardo’s pictures carried a beguiling air of the metaphysical – and had this quality not derived from the artist’s preternaturally intense engagement with natural phenomena and the mysterious powers which operate through them? Had a new corroborating body of drawn studies emerged? The Gallery admits that not only is there no identifiable Leonardo brushwork but that the picture itself is “manifestly uneven in finish and execution” and that there has been “a good deal of agreement that Leonardo himself painted little or none of it”. When we asked if any securely autograph Leonardo paintings shared these newly claimed characteristics, Syson said that they were also found in the “Last Supper”, when only 20% of that large, fragmented, degraded, many-times restored, de-restored and re-restored mural survives – and when its recent restorers “discovered” that it had originally been choc-full of tiny naturalistic details (curtain hooks, slices of lemon, reflections on glassware, tablecloth patterns and so forth). Above all, the National Gallery’s latest upgrade flew in the face of – and seemingly sought to circumnavigate – a landmark 1996 article by a geologist (and now art historian), Ann Pizzorusso, who has shown that while the rock configurations in the Louvre version were entirely consistent with precise formations found in nature and in Leonardo’s own studies, those seen in the London version were found in neither. (See Pizzorusso, “Leonardo’s Geology: The Authenticity of the Virgin of the Rocks”, The MIT Press, Vol. 29, No. 3, and “Leonardo’s Geology: The Authenticity of the Virgin of the Rocks”, in Leonardo Magazine, Vol. 29. No. 3, 1996, pp. 197-200.) Here, Pizzorusso presents further elegant demonstrations of the London picture’s non-autograph status that are manifest in the (recently restored) late Leonardo masterpiece, “The Virgin and Child with St Anne”. 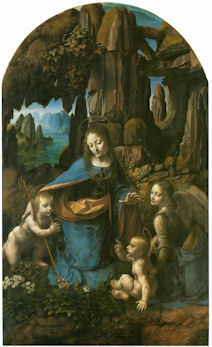 London’s National Gallery recently announced that its version of the “Virgin of the Rocks”, previously attributed to various artists who worked in Milan, was now, after being cleaned, solely the work of Leonardo da Vinci. The National Gallery supports its claims by stating that the work represents a change in style and that the geology in the picture is rendered in a more abstract, monumental style (see Appendix A). While art historians have long discounted the National Gallery’s version as one by Leonardo, the Gallery has now discounted centuries of scholarship with their new interpretation and subsequent attribution of the painting to Leonardo. What is most ironic and troubling about the National Gallery’s position is that there are reams of contractual documents which still exist today documenting a 25 years long lawsuit concerning the two versions of the painting and which show, unequivocally, that Leonardo did not paint the version in the National Gallery. Prof. Charles Hope, a former director of the Warburg Institute, London, and an expert in notarial Latin states that there is no doubt that Leonardo painted the first version and not the second (New York Review, 9 February 2012). While we may be able to forgive the National Gallery for not being up on notarial Latin, there is no excuse for their proposal that Leonardo changed his style. In the decades in which I have studied Leonardo from all aspects (we must remember, Leonardo did not consider himself primarily a painter) one thing stands out in all his works—a fidelity to nature and a lifelong effort to depict natural objects as realistically as possible. The father of Leonardo studies, Carlo Pedretti, in his book analyzing Leonardo’s nature drawings, “Leonardo da Vinci Nature Studies from the Royal Library at Windsor Castle” (with a forward written by Kenneth Clark, a former director of the National Gallery in London), devotes the entire volume to discussing Leonardo’s preoccupation with natural objects and his fanaticism in attempting to depict them as realistically as possible. This passion was imparted to his students, Francesco Melzi, Cesare da Sesto, Giovanni Boltraffio and Marco d’Oggiono. So much so that a drawing of a Tree (RL 12417), long thought to be by Leonardo, was later attributed to Cesare da Sesto and a view of Amboise (RL 12727) to Francesco Melzi. In analyzing the works of Leonardo’s students one can see that they have followed Leonardo’s technique and depicted natural objects as realistically as possible. They had obviously heard quite a bit of ranting by Leonardo about “Botticelli’s bad landscapes” (see Appendix B). Another reason why Leonardo’s approach is reflected in his art is that he was born in the transitional era of the late Middle Ages, an age still filled with superstition and fear, especially about such things as mountains, natural catastrophes and death. He grew up leading the way into the Renaissance, faced all these fears, and debunked them. He travelled extensively in the Alps outside of Milan taking note of nature and geology. He noted landslides and torrential flooding with its associated damage (see Figs. 3 & 4), he dissected corpses to provide the most accurate depiction of human anatomy we have ever had until relatively recent times. His work as engineer, geologist, botanist and astronomer cannot be disconnected from his work as an artist (see Figs. 8 & 9). To understand Leonardo, one must understand him completely. And to understand him completely is not difficult. He has written everything down. He was faithful to nature. If one applies just that one rule to Leonardo da Vinci, looking at his work from a scientific standpoint, the answer is crystal clear: fidelity to nature is a Leonardo trademark that can be used to determine the authenticity of his work. Now that we have seen that the National Gallery has preferred not to acknowledge the work of many esteemed Leonardo scholars, maybe looking at the recently cleaned “Virgin and Child with St. Anne” in the Louvre will change its mind (see Figs. 1, 7, 10, 11, 14, 17, & 21). The “Virgin and Child with St. Anne”, dated to about 1510, came later than the National Gallery version of the “Virgin of the Rocks”. We do not know how much later, as the National Gallery has now dated the initiation of its version of the “Virgin of the Rocks” as 1491/2-9 and its completion to 1506-08. Professor Hope, in his review of the notarial documents regarding the lawsuit states that the National Gallery version of the “Virgin of the Rocks” could not have been painted before 1508. If we use the 17 year time period (1491-1508) which the National Gallery cites for its “Virgin of the Rocks”, it would mean Leonardo was painting the “Last Supper” (1492-7/8), completing the Burlington Cartoon (1499-1500 or 1506-08) and the “Virgin of the Rocks” at the same time. On page 96 of Kenneth Clark’s book entitled “Leonardo da Vinci” he indicates that Leonardo was exceptionally busy. Apart from the first “Virgin of the Rocks” his time was taken up with work for the court. He was the court limner and also painted two portraits of the Duke’s mistresses Cecilia Gallerani and Lucrezia Crivelli. With these portraits, we would be up to five major works in progress by Leonardo if we include the National Gallery’s “Virgin of the Rocks”. This being said, all of these works being done at nearly the same time gives us the perfect opportunity to appraise, determine and evaluate the stylistic traits of the artist at that period of his career. In looking at the Burlington Cartoon and the “Virgin and St. Anne”, both are rich with geologic detail and accuracy. Leonardo has risen to new heights in his portrayal of landscape elements. His talent and passion are vividly displayed in the Burlington Cartoon and he reaches a level of sophistication, subtlety and accuracy in rendering the geology in the “Virgin and St. Anne” which had never been seen before (see Appendix C). The St. Anne is a geologic tour-de-force. In fact, Leonardo experimented extensively on developing paints and a technique for depicting the pebbles of agate, chalcedony and marble at the feet of the Virgin and St. Anne (see in particular, Figs. 1 & 21). Leonardo writes in his notebooks about his efforts and how satisfied he was to have developed an approach to rendering the pebbles in such a realistic fashion. In fact the entire painting is one geologic treat after another. He had spent years in the Alps so he knew the landscape and geology exactly. With his newly developed technique for painting marbleized pebbles he was delighted (- see Appendix D). Using a date of 1510 for the “Virgin and St. Anne” and a date of 1483-86 for the “Virgin of the Rocks”, both in the Louvre, we have proof that Leonardo did not change his style, and that, if anything, he became more fanatical in his quest for geologic accuracy, developing new paints and techniques for natural depiction and driving his students to deliver the most accurate depiction of nature in their own works. So we must ask the question “How and why could Leonardo have changed his style to produce a work so lacking in geological and botanical accuracy as the ‘Virgin of the Rocks’ in the National Gallery in London?” There is no evidence Leonardo changed his style and now, with the recently cleaned “Virgin and St. Anne”, we have that proof. We also know that his students were inculcated with his passion for accurate depiction of natural objects so we must also exclude his students as authors of the National Gallery work. It would be best for the National Gallery to reopen the case for the attribution of the work to Leonardo. Hundreds of years of scholarship by Leonardo critics as well as the words and the works by Leonardo himself should not be discounted. The National Gallery does a disservice to those who have worked so hard to come up with incontrovertible evidence regarding the attribution of this work and most of all the National Gallery does a disservice to Leonardo himself. The National Gallery catalogue, “Leonardo da Vinci, Painter at the Court of Milan”, page 174. Leonardo da Vinci, from: “Treatise on Painting”, the chapter on Criteria and Judgments, the subsection “How a painter is not worthy of praise unless he is universal”. Walter Horatio Pater, “The Renaissance, Studies in Art and Poetry”, The Echo Library 2006, page 54. “The movement of the fifteenth century was twofold; partly the Renaissance, partly also the coming of what is called the ‘modern spirit’, with its realism, its appeal to experience. It comprehended a return to antiquity, and a return to nature. Raphael represents the return to antiquity, and Leonardo the return to nature. In this return to nature, he was seeking to satisfy a boundless curiosity by her perpetual surprises, a microscopic sense of finish by her finesse, or delicacy of operation, that subtilitas naturae which Bacon notices. So we find him often in intimate relations with men of science – with Fra Luca Paccioli the mathematician, and the anatomist Marc Antonio della Torre. His observations and experiments fill thirteen volumes of manuscript; and those who can judge describe him as anticipating long before, by rapid intuition, the later ideas of science. He explained the obscure light of the un-illuminated part of the moon, knew that the sea had once covered the mountains which contain shells, and of the gathering of the equatorial waters above the polar. “Notebooks and sheets of about 1508 contain a number of notes on ‘mistioni’ (mixtures), a plastic material of his own invention with which he aimed at imitating the colour and design of semi-precious stones. He describes his production process and how, once the objects were thus produced, he spent much time finishing them with his own hand to a smooth and glossy surface…At the same time he was much taken by anatomical studies, so that when he described the production process of his ‘mistioni’ he came to specify the effect that was to be achieved: ‘…then you will dress it with peels of various colours, which will look like the mesentery of an animal’. “In 1502, Francesco Malatesta wrote Isabella d’Este that Leonardo had looked at many of the Medici gems and objets d’art made of stone. 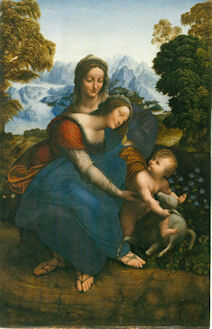 Leonardo praised ‘the one of amythyst or jasper as Leonardo baptized it, because of the admirable variety of its colours’”. Carlo Pedretti, Leonardo, A study in Chronology and Style, London, 1974, pages 132-137. Above, Fig. 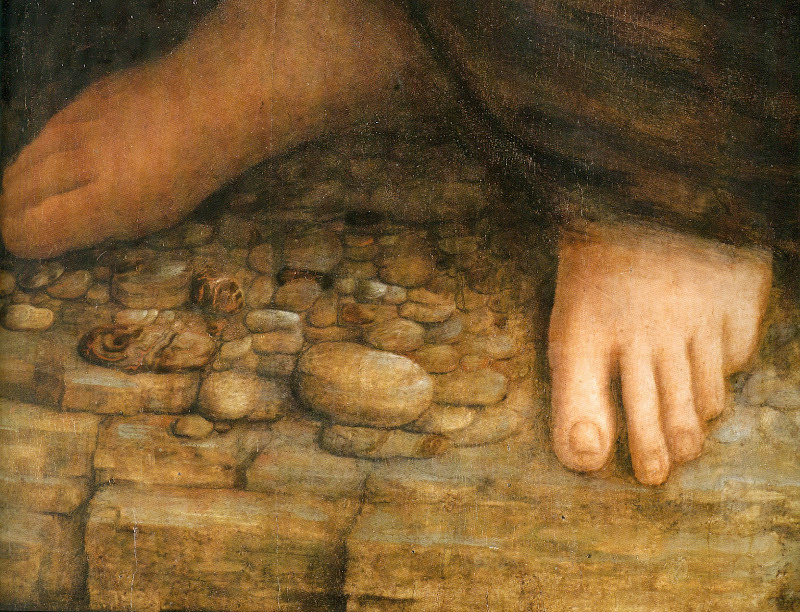 1: St. Anne’s feet and pebbles – a detail from the Louvre’s recently restored “Virgin and Child with St. Anne”. Above, Fig. 2: The treatment of rocks seen at the base of the National Gallery’s the “Virgin of the Rocks” as seen before the recent restoration. Above, Fig. 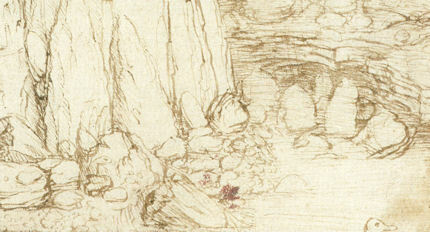 3: A detail of Leonardo’s “A rocky ravine”, a pen and ink drawing in the collection of Her Majesty the Queen. In a note by Per Rumberg in the catalogue to the National Gallery’s 2011-12 “Leonardo da Vinci – Painter at the Court of Milan” exhibition (p. 184), attempt is made to accomodate the drawing within the new “metaphysical” reading of the Gallery’s “Virgin of the Rocks”. The drawing itself, however, remains awkwardly elusive and “controversial” in terms of chronologies and its geological testimony. It has variously been dated from the early 1470s to the 1490s. The Gallery takes a “Goldilocks” option and settles for “about 1480-83″. “Although the appearance of the precipice in this drawing is similar to geological formations that occur on the banks of the Arno near Florence, the overall composition also relates to formulae seen in contemporary painting and prints”. With that linkage and one bound, as it were: “This coexistence of the real and the imagined is particularly interesting when considering the relevance of this sheet to the [London] “Virgin of the Rocks”. 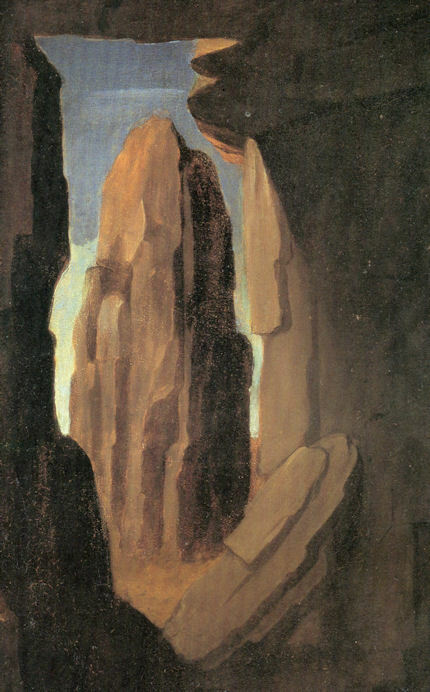 Specifically, “The precipice, with its distinctive cluster of vertical pinnacles leaning against a clif”, it is said, “anticipates the mystical landscape in the [London] altarpiece”. But insofar as it might be thought to do so, it anticipated that of the earlier Louvre version rather sooner – unless one maintains that the unquestionably autograph Louvre version was not yet sufficiently mystical. 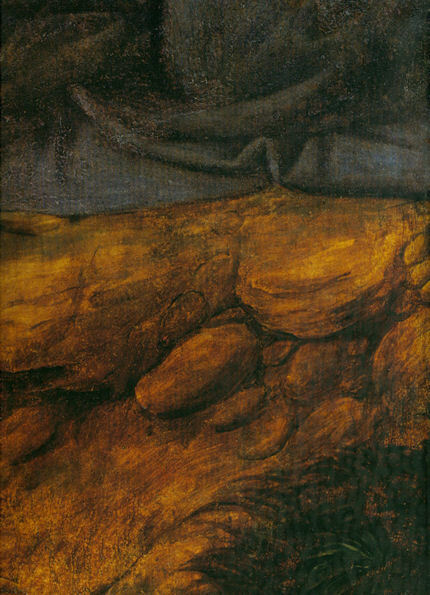 In any event, this “mystical/not-mystical” construct founders on hard geological fact when “another detail” of the drawing – “the curved strata on the bottom of the river bed” is admitted to bear “a close resemblance to the stratified layers of rocks forming the ledge in the foreground of the Louvre version of the picture” while no such configurations are present in the London picture. Above, Fig. 4: In the catalogue to the Louvre’s celebration of its restoration of Leonardo’s “Virgin and Child with St. Anne” (La Sainte Anne ~ l’ultime chef-d’oeuvre de Leonardo de Vinci), this astonishing drawing – also from the Royal Collection at Windsor – is reproduced. 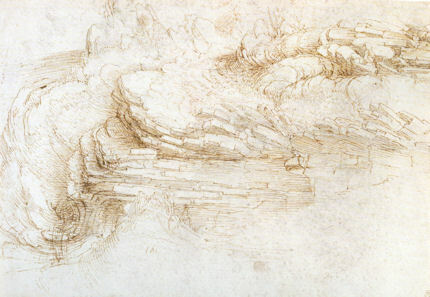 Dated to 1500-1510, it testifies to Leonardo’s enduring fascination with stratified sedimentary rocks which, here, are shown subject to further “liquefying” geological forces. As Pizzorusso argues, it would indeed be hard to imagine a more disabling lacuna in the London “Virgin of the Rocks” than this lack of such rock strata. Above, top, Fig. 5: the bottom of the Louvre “Virgin of the Rocks”; middle, Fig. 6, the bottom of the London “Virgin of the Rocks”; bottom, Fig. 7, the base of the Louvre’s “Virgin and St. Anne”. In this chronological sandwich, the central picture, sans stratified rock formations, is the clear “odd man out”. If the Syson/Keith hypothesized philosophical shift were accepted, it would be, as Pizzorusso points out, imperative to explain why Leonardo abandoned his rock preoccupations in the London picture only to resume and carry them to the new and unprecedented technical heights achieved in the “Virgin and St Anne”. The “theological”/conceptual apologia for the London picture’s long questioned properties, simply does not withstand visual scrutiny. 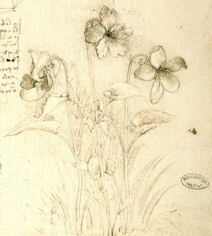 To attribute some elevated expression of the “supernatural” to the generalised, botanically-imprecise plants in the London picture (“the flowers appear to be ideal composites of of the leaves and petals of real plants”) is implicitly to slight Leonardo’s corpus of plant studies, when no one – not even Durer – has equalled the sense he bestowed of life itself upon the humblest plant. More damaging than the deficiencies of the component parts of the London picture, is the overall slovenliness of its dispositions, the absence of Leonardo’s miraculous, sure-footed placements evident above in both Louvre pictures. The London picture is full of clumsinesses. The bloated, formulaic depictions of plants are carelessly strung along the foreground without apparent thought, purpose or design. The infant is bloated; the drapery incoherent and chromatically at war with aerial perspective; the rocks little more than a shorthand. Above, left, Fig. 8: A sheet of studies, that has been dated to “about 1487-90”, from the Bibliothèque de l’Institut de France (B fol. 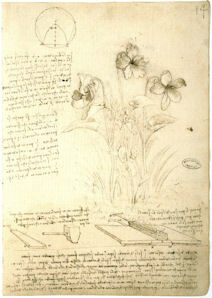 14r), showing Leonardo’s study of violets and designs for a means of soldering lead roof coverings. Above, right, Fig. 9: A detail of the sheet at Fig. 8. Above, left, Fig. 10: The “Virgin and Child with St. Anne”, as recorded in a postcard of 1900. Above, right, Fig. 11: The “Virgin and Child with St. Anne”, as recorded after its recent restoration at the Louvre. What is striking in this photo-comparison is the greater sense of spatial depth and plastic articulation in the earlier record. There is today, markedly less sense of the conflicting cruciform sweeps of diagonals, where we formerly saw a more pronounced swing down from top right at the crown of the tree, through St. Anne’s (then more forcefully drawn and shaded) left arm and elbow, through the successive arm/knee/arm/knee configuration of the Virgin, down to the placement of St Anne’s feet on the then more brightly “spotlighted” left section of the rocky foreground. Against that progression, we better saw in the earlier state how Leonardo had orchestrated a countervailing upper left to bottom right sweep through the principal heads and the arms of the Virgin and the Child, down to the rump and tail of the lamb – a movement that was decisively echoed and enforced by the parallel diagonals of the Virgin’s right leg and St. Anne’s left leg. The postcard is reproduced in the catalogue to the Louvre’s recent “La Sainte Anne ~ l’ultime chef-d’oeuvre de Leonardo de Vinci” exhibition. Needless to say, it is not shown next the post-restoration state of the painting today. If restorers were recovering not shedding pictorial values, would they not be as tempted as we to show such helpful historic photo-comparisons? Above, left, Fig. 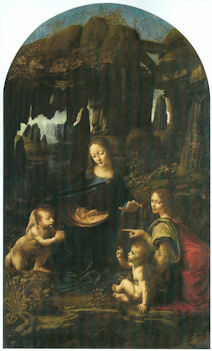 12: The Louvre’s “Virgin of the Rocks”, by Leonardo. Above, right, Fig. 13: The National Gallery’s “Virgin of the Rocks”, by whomever. Above, left, Fig. 14: The recently restored “Virgin and Child with St. Anne”. Above, right, Fig. 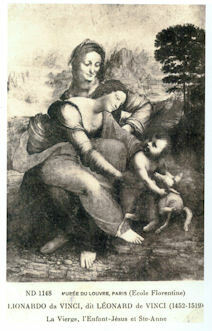 15: a contemporary copy (1508-1513) of the “Virgin and Child with St. Anne” from the Armand Hammer Museum of Art, the University of California. 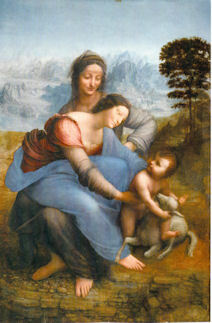 It might be noted that in the copy, the central background rocky outcrops flanking the head of St. Anne are darker than those seen in the Leonardo today – as were those of the picture itself as seen in the 1900 photograph at Fig. 10. More noteworthy perhaps, is the treatment in the copy of the rocky foreground. 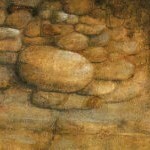 At the left we see a fairly attentive attempted repetition of the detailed strata and pebbles of the original work, but curiously, as work proceded to the right, interest seem to wane and the artist resorted to the lazy rounded rocky shorthand used throughout in the London “Virgin of the Rocks” as seen here in close-up at Fig. 16. Above, Fig. 16: A detail of the National Gallery “Virgin of the Rocks”. Above, Fig. 17: A detail of the Louvre’s recently restored “Virgin and Child with St. Anne”. A comparison with the testimony of the postcard at Fig. 10 would suggest that (as with the dance floor seen in Renoir’s “Dance in the City” in the previous post) the ground plane has suffered considerable abrasion. 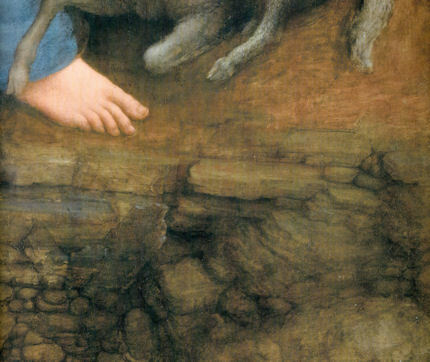 The limbs and tail of the lamb would seem to have been weakened and particularly so in the case of the drawing and the modelling of the right foreleg which crosses the Virgin’s drapery. Above, Fig. 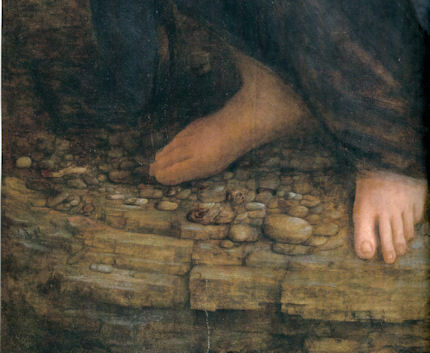 18: A detail of the National Gallery’s “Virgin of the Rocks”. Above, Fig. 19: Unfortunately, the attribution of slack and shoddy painting to a great master is not without precedent at the National Gallery. Here we see at the top, a fragment of a niche sculpture of Venus and Cupid shown in the background of a large panel painting of Samson and Delilah that was given to Rubens in 1930 in a certificate of authentification written by the Rubens scholar Ludwig Burchard. On the strength of that certificated attribution, the work was sold in 1980 to the National Gallery for a then world record Rubens price (and then second highest price for any painting) and has been upheld as an autograph Rubens ever since. 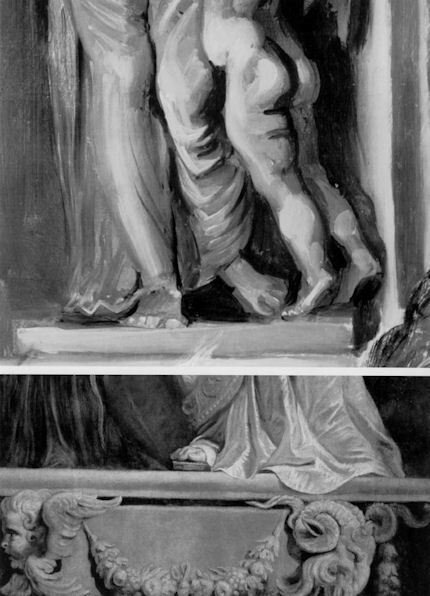 By contrast, the image at the bottom is a passage of painting from the left wing of the securely documented and autograph Rubens panel “The Raising of the Cross”. As was discussed in a special issue of the ArtWatch UK Journal of Spring 2006, the “Samson and Delilah” has been dated at the National Gallery to 1609 and “around 1610” – and therefore effectively to the same date as the “Raising of the Cross” of 1609-1610. The photographs, and the different levels of handiwork that they record, speak for themselves. In 2005 a dedicated website was established in opposition to the attribution. Above, Fig. 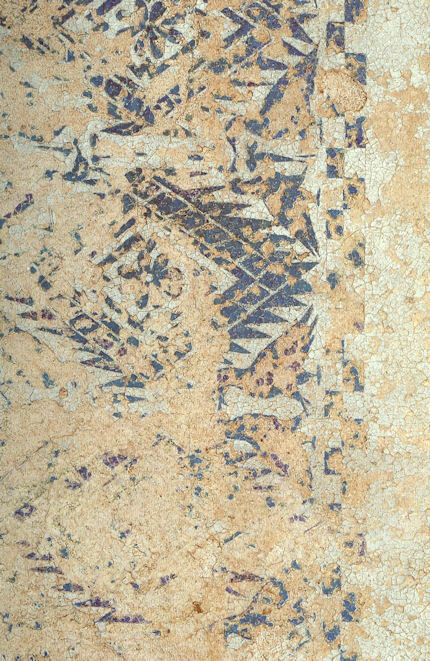 20: A much-injured fragment of tablecloth decoration on Leonardo’s “Last Supper”. Above, Fig. 21: A detail of the Louvre’s recently restored “Virgin and Child with St. Anne”.